TDK absorber is the original polystyrene based material and is impervious to water and humidity. Carbon and fire retardant properties will not wash out or leach out of the absorber if exposed to water or high humidity. 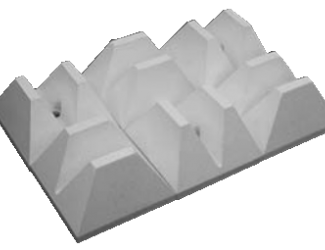 Our polystyrene absorber does not deteriorate when exposed to the environment. Competitive absorbers tend to react with environmental moisture and various chemicals over time, which causes degradation of the substrate, and eventual loss of carbon (i.e., carbon falls out of the absorber and performance declines). TDK absorbers have a proven performance record for 40+ years. TDK backs the absorber with an extended warranty for both mechanical stability and electrical performance. TDK backs this warranty with nearly forty (40) years of internally and independently verified empirical data. Polystyrene absorber is dimensionally stable. It will not expand and contract in many varying environments and it will not “droop”, “twist”, or “sag” over time. Carbon is dispersed more evenly in polystyrene absorber (by nature of the manufacturing process). This means better impedance matching with ferrite tile and more predictable and repeatable performance from very low frequencies to very high frequencies (40GHz+). TDK manufactures all of its own absorbers, meaning TDK has better control over quality and delivery schedules. To our knowledge, TDK's absorber manufacturing facility is the only ISO 9001 and ISO 14001 certified facility in the world for production of this type of material. TDK absorber meets NRL Class 1,2,3, UL94HBF, UL94-5VB, and DIN 4102 Class B flammability specifications as well as ASTM standards. TDK absorber is the only material that is listed by Underwriters Laboratory for EMC and Antenna evaluation test chambers. 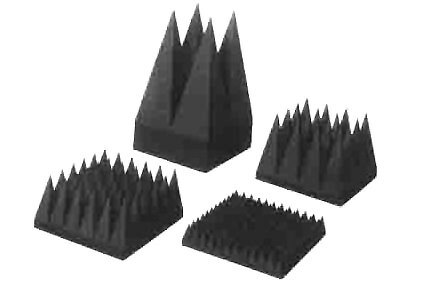 This is a pyramidal electromagnetic absorber with a corrugated structure that consists of an inorganic base and utilizes the ohmic loss of carbon. The corrugated structure is designed to radiate heat efficiently during power irradiations of 1W/cm² or greater. This is a 12-cm long pyramidal electromagnetic absorber with a corrugated structure. It delivers excellent electromagnetic absorption performance over a wide band between 0.8 and 110GHz. Our line up includes ICT-030 that delivers excellent electromagnetic absorption performance starting at low frequency ranges. These products are optimally suited for anechoic chambers and small anechoic dark boxes used in high-power tests. Fire retardant (NRL Classes 1, 2 and 3; UL-94HF-1). This is a composite electromagnetic absorber made by combining the IP-BX electromagnetic absorber, which consists of a styrofoam base and utilizes the ohmic loss of carbon, and an electromagnetic absorber that uses the magnetic loss of ferrite. Each of the loss material are matched for impedance to deliver excellent electromagnetic absorption performance from as low as the 70MHz FM band. These TDK composite electromagnetic absorbers have been praised highly in tests for automobile antennas. IP-100BX delivers excellent electromagnetic absorption performance for vertical incidences starting at the FM band to the microwave range. IP-130BX delivers excellent electromagnetic absorption performance for oblique incidences starting at the FM band to the microwave range. These products are used widely in anechoic chambers for testing automobile antennas and large special purpose anechoic chambers.